For a while now a few people have asked for a spell list. 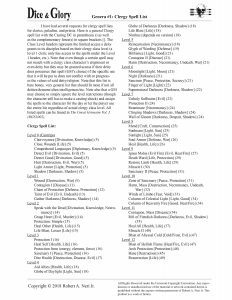 A list that those playing Clerics, Paladins, Priests, and other Clergy Class characters with spellcasting abilities can use. So, I have come up with a very general spell list conveniently sub-categorized into levels. Genera will consist of requested material and various self-contained excisions from published material that would not otherwise see the light of day. Click the link below to download the PDF via the Mediafire website. This file can also be had via the Dice & Glory Players League on FB as well in the Files section.